Here's the exciting things going on at FCQC. Come join the fun, and bring a friend. August 30, 2017 5:00 p.m. to 7:30 p.m. -- T-Shirt Quilt Class. 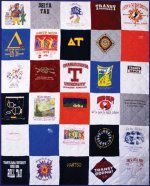 Turn that drawer full of t-shirts into a quilt to remember! Two spots available in this class. Click here for more information. September 7, 2017 5:30 p.m. to 8:00 p.m. -- Beginning Piecing and Rotary Cutting. Betty will get you on your way to making your first quilt. For more information about this twelve-week course, click here and we will get you the information. Only three spots left. September 8, 2017 6:45 a.m. -- Quilt Expo Bus Trip. Let us do the driving for you. Your deluxe motorcoach will begin loading at 6:45 a.m. and drive you to Madison for Wisconsin's Superbowl of Quilting. $40 will get you a seat and includes driver gratuity and admission to the event. Sit back and relax. We've got you covered! Seats still available up to the day before we leave! September 14, 2017 4:00 p.m. to 7:00 p.m. -- Free Motion Quilting, The Basics and Beyond. Wendy Fuller will help you take those quilts to the finish line in this hands-on class. Seats still available. More information is available here. September 16, 2017 12:00 p.m. to 1:00 p.m. -- Birthday Club. Such a fun club to meet your fellow quilters and get some help with your quilts. By clicking here you will find all the information you need to sign up for this monthly club. September 23, 2017 10:00 a.m. to Noon -- Twister Pumpkin. Marge is going to show you how to make this adorable pumpkin using the twister tool. Just in time for fall, you will want to make even more with a series of incredible patterns. Click here for more information on this just added class! You can always sign up for any of these classes by calling the shop. We're here to help.